Active Aging is all about being physically active – but don’t forget the mental component! Staying mentally sharp is a critical aspect of healthy aging, too. According to the Alzheimer’s Association, Alzheimer’s is the 6th leading cause of death in the United States and affects millions of people every day. The disease is trying for seniors, their families, and their communities, but there’s good news. You can slow and even prevent dementia and Alzheimer’s with simple, regular active aging sessions. The Alzheimer’s Research and Prevention Foundation stresses the value of exercise for senior citizens. 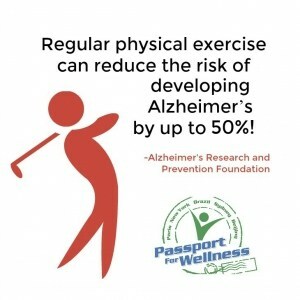 In fact, they state that regular physical exercise can reduce the risk of developing Alzheimer’s by up to 50%! It also greatly reduces memory loss and cognitive decline. What can be better than physical exercise? Mental exercise! The ARPF also reports that mental exercise can reduce your chance of developing Alzheimer’s disease by up to 70%. Engaging in regular “brain aerobics” is vital for staying mentally sharp. It involves more than one of your senses. It breaks a routine activity in an unexpected, nontrivial way. A healthy social life, healthy diet, and getting enough sleep also play a part in keeping seniors mentally healthy and fit. Our exercise videos are made with an understanding of how instrumental physical and mental activity is to the Active Aging Community. Our fitness streaming program involves multiple senses, breaks up the routine in your Assisted Living Facility, and engages the attention of participants. That’s why we stimulate seniors on a physical, social, and mental level with each episode! 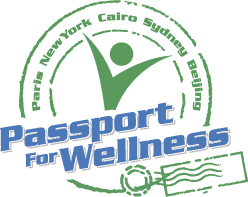 Historical facts, trivia, and recall questions are integrated seamlessly into the Passport For Wellness program. Stretching, flexibility, and 20 continuous minutes of aerobic exercise aid in keeping seniors physical fit. Try the #1 fitness video streaming program for seniors! Your loved one or assisted facility residents are sure to love and benefit from our one-of-a-kind program. Try our program for one month free today.